CBRE has committed to help combat climate change by making a voluntary pledge to the Victorian Government’s TAKE2 Climate Change Pledge Program. Launched by Premier Daniel Andrew and Minister Lily D’Ambrosio in June 2016 and led by Sustainability Victoria, the TAKE2 program aims to achieve net zero carbon emissions in Victoria by 2050. CBRE is one of more than 250 businesses to have taken the pledge across a range of key industry sectors, representing a total of 260,000 employees. VMware is on a mission to ensure a net positive effect across our products, people and planet. This Earth Day, we are taking action to inspire a ripple effect through our collective impact. For every employee that pledges to take sustainability-related actions at home or at work, VMware will plant a tree on their behalf through Restore the Earth (REF) Foundation. But why is a digital transformation company that puts data in the cloud, also putting trees in the ground? KOHLER, Wis., April 18, 2017 /3BL Media/ – The Kohler Signature Store by First Supply has become the first retail space in the U.S. to receive Leadership in Energy and Environmental Design (LEED) Gold certification under the new LEED v4 guidelines. The U.S. Green Building Council (USGBC) awarded the 5,800 square-foot showroom located in Wauwatosa, Wisconsin, LEED Gold v4 for Interior Design & Construction Retail. 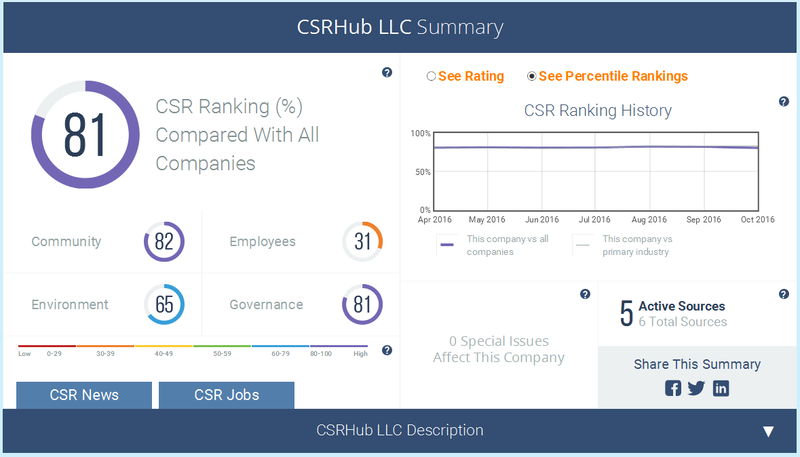 See the CSRHub LLC Summary Rankings.